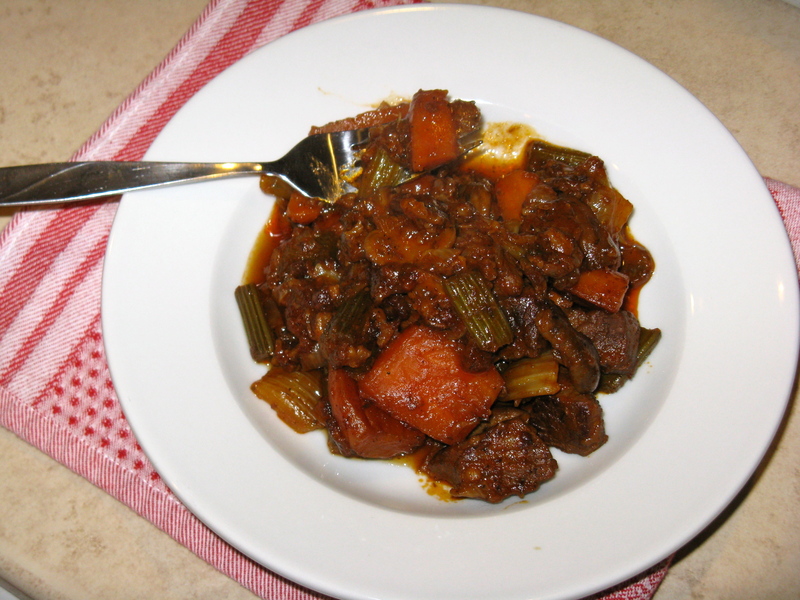 Go make this sweet and smoky beef stew! I can’t tell you how amazing this concoction tastes. I threw ingredients in the pot that I thought would work well together, and the result kind of blew my mind. My only regret is that I didn’t make a bigger batch. Jesse and I gobbled it all up and didn’t have any leftovers. It is SO good! Meanwhile, I am so happy and relieved today! Midterms are officially over and I got a PERFECT score on my muscle anatomy practical. Tonight, I don’t have to do any studying and I have a long weekend (no school on Monday). Things couldn’t be any better, really. Tomorrow, I’m treating myself to breakfast out after my morning workout, and then in the evening, Jesse and I are going out with a friend. It’s so good to have things to look forward to and have a light at the end of the tunnel. Heat large pan over medium heat. Add the chopped bacon and stew meat (no need for oil b/c of the bacon) and allow to cook and brown, stirring frequently. Once meat is done, remove from pan with a slotted spoon and set aside (if don’t have a slotted spoon, use a regular spoon and try to keep the bacon grease in the pan for sautéing the vegetables). Add the onion, celery, and garlic to the pan and stir. After a couple minutes, add the carrots and mushrooms. 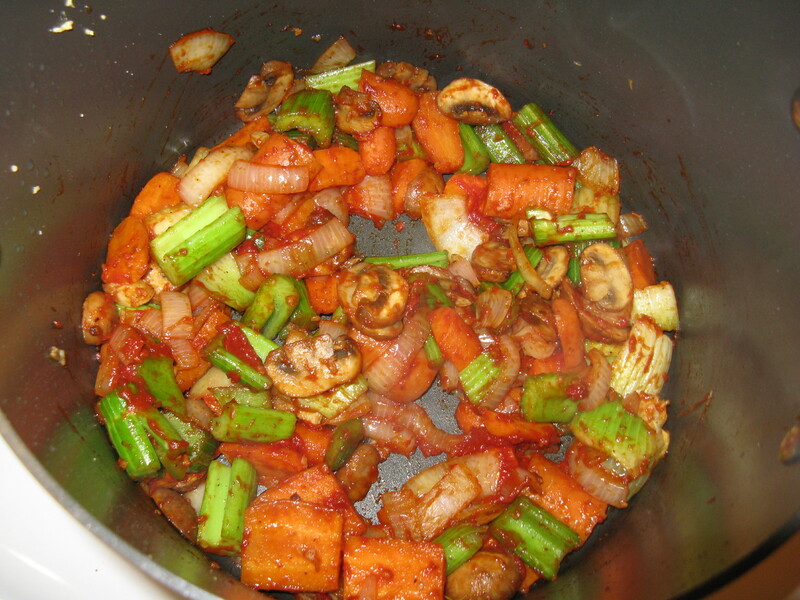 Stir frequently until the vegetables are soft, about 10 minutes. Then, add the tomato paste, bone broth, apple cider vinegar, spices, and sea salt and pepper. Add the stew meat back to the pot. Mix well and bring to a simmer. Turn heat to low and cover the pot with a lid (may need to tilt lid slightly, so it’s not sealed). Let simmer for about 3 hours. Enjoy! Did you make the bone broth yourself? Looks delic! Yep, I always make my own bone broth. It’s super easy, especially with a slow cooker! Congrats on your exam! Enjoy your weekend. This stew looks delicious. Mmmm bacon! made this for dinner the other night. thank you!!! it was so damn good. Awesome, thanks for giving it a shot! I agree, it is SO damn good! Just to clarify, you added the meat back in before you simmered for 2-3 hours, correct? Yes, that is correct! If not, the meat wouldn’t be nice and tender. i’ve seriously made this like 5 times in the past 1.5 months since you posted this! i’ve made sure that grass fed stew beef is always in my meat order 🙂 it is delicious and SUPER easy, thanks! How many servings does this recipe make? I’m looking forward to making it! For us, it was only 2 servings. You can definitely double the ingredients though to make a larger pot. It’s incredibly satisfying! I hope you enjoy it! I recommend going the slow cooker route, so you have nice tender beef that you can shred apart if you want. This is what I did when I first tried beef after more than 10 years of not eating it! I just used beef stew meat and slow cooked it with veggies, curry paste and coconut milk for a few hours. It came out juicy, flavorful and very tender. 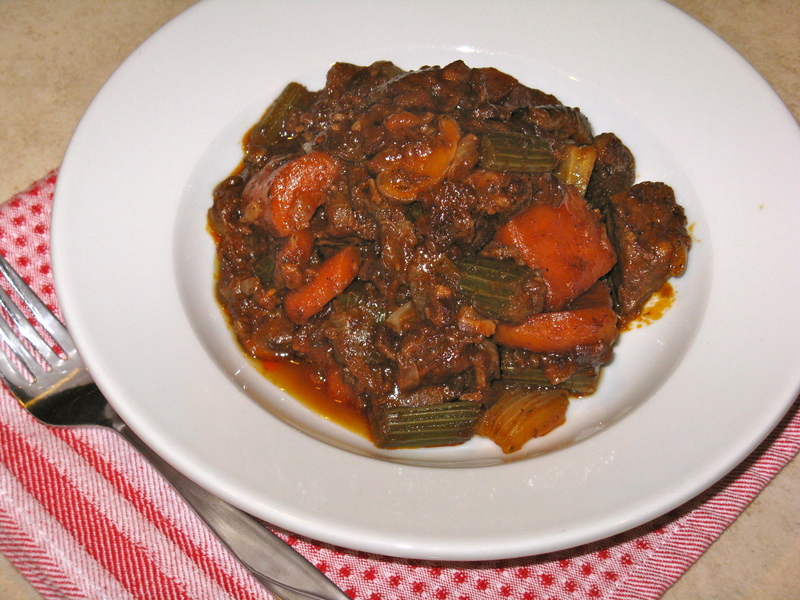 This stew is even a great option!